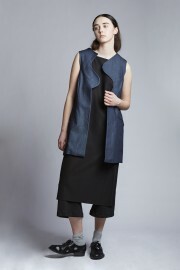 RHODAWONG is a New York based brand by Rhoda Wong, a contemporary womenswear designer for urban, everyday goers. The founder's simple and line focused designs has similarities with abstract art. The label sets out to challenge new ways of designing ready-to-wear. Rhoda likes to play with hemlines, pinning the bottom of shirts to the middle of the design, and exposing the inner linings, and creating interesting, ruched shapes within the clean lines of her silhouettes. Starting RW at 18, by age 20 her designs have been worn by celebrities and appeared in publications such as Vogue and Nylon.